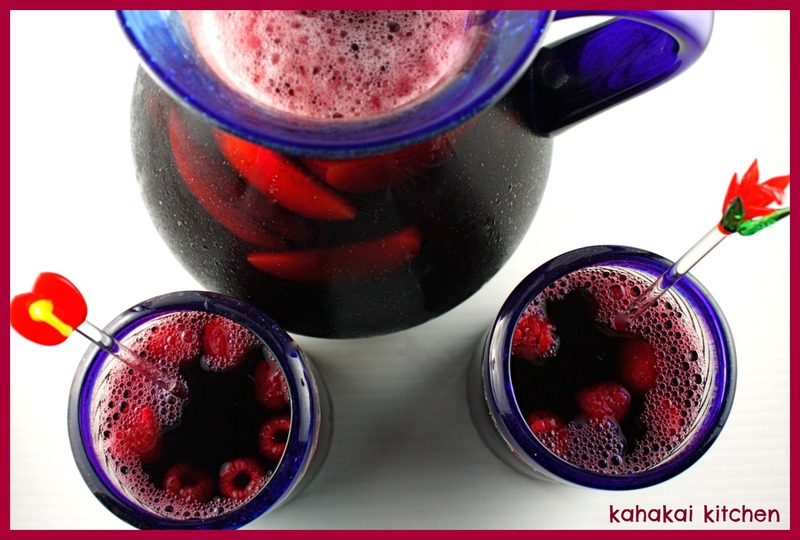 Sangria is like a late summer party in a glass. This one, by Rick Bayless, gets a little pizazz from tangy jamaica flowers (the cousin to our tropical hibiscus) and Cointreau. Refreshing and perfect for sipping on a warm day. Rick says, "Certain agua de jamaica flavors (and certainly the color) echo what I love about young red wine. 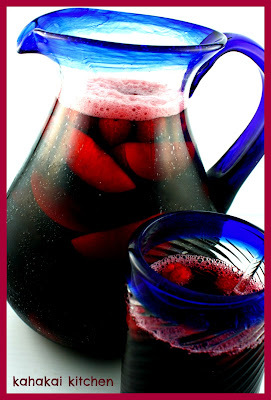 Add a little orange liqueur--even some chopped fruit if that appeals--and you've got a pretty cool twist on sangria." In a very large pitcher (or two smaller ones), combine the wine, jamaica and Cointreau. Cover and refrigerate until chilled, at least 1 1/2 hours. When you are ready to serve, pour into wine glasses over ice. 2 cups (2 ounces) dried jamaica "flowers"
In a medium (3-quart) stainless or enameled saucepan, bring 1 1/2 quarts of water to a boil. Add the "flowers" and sugar. Stir for a minute or so, while the liquid returns to a boil and the sugar dissolves. Cover and let steep for at least an hour, but no more than 2 hours. Pour the mixture through colander or strainer into a large bowl, pressing on the "flowers" to extract as much liquid as possible. Stir in 3 cups water. Note: This recipe makes a tart version of auga de jamaica; feel free to stir in more sugar, if that appeals to you. Store covered in the refrigerator in a noncorrosive container (preferably one that won't strain). Notes/Results: An excellent sangria. The jamaica cooler is sweetly tart and refreshing on its own, mixed with the sweet red wine it becomes even more appealing and the Cointreau adds bright citrus notes. I confess that my favorite part of sangria is the wine soaked fruit--in this version I used slices of red plums, red grapes and raspberries. I would make this again. Our theme at I Heart Cooking Clubs this week is ¡Esta Rojo!--dishes in shades of red. Why do the flowers get inverted commas? Aren't they REALLY flowers? This is a beautiful choice for our red theme! I love the flavor of jamaica and know I would enjoy a glass or two of this. The wine-soaked fruit is my favorite too. This looks absolutely wonderful! Mmm! Gorgeous color!! This looks so refreshing! We call these flowers, "Roselle" over here. These are great in drinks. Love it, the vibrant red is simply gorgeous! Perfect for Esta Rojo! What a gloriously colourful pitcher of goodness! I'd happily toast to your health with a glass or six. I'm such a sucker for a good sangria! I seriously could drink it like soda. This sounds like a fabulous flavor combo...I wish I could find jamaica flowers here! What a fantastic idea! I will certainly have to try this- and soon! 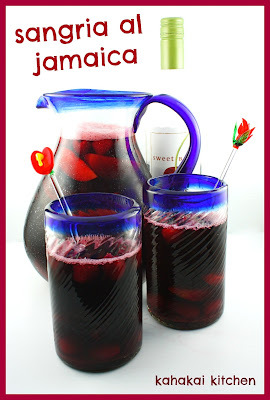 I'm a sucker for Sangria and this one looks great! Where did you find the jamaica flowers?